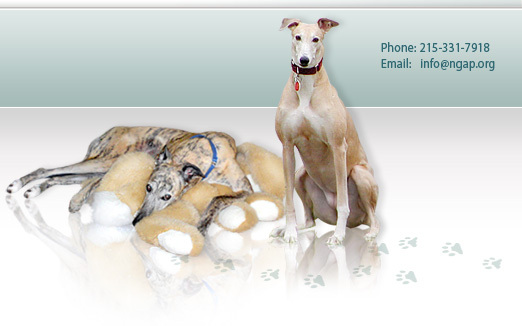 Here at National Greyhound Adoption Program/Dutton Road Veterinary Clinic, we do not hesitate to anesthetize a greyhound, whether it is for dentistry, extractions, growth removal, or something more serious. It is not just about the anesthetic protocol that we use; it is about following the dog throughout the procedure and knowing that every member of the surgical team is doing their job. 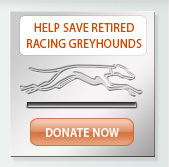 A short time ago at a local clinic, a seven-year-old greyhound died under anesthesia during a dental procedure. The dog stopped breathing and they were unable to revive it. Whether that happened here or somewhere else, we always take a step back and try to determine the potential reasons for an animal’s death. It is a loss for all of us. Dogs die because something has failed. 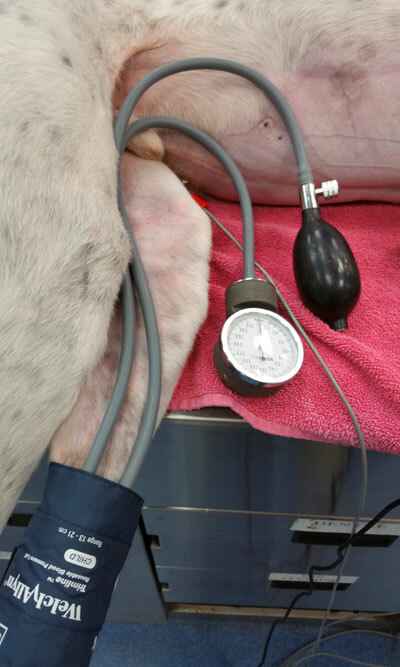 Failure can be from a multitude of things: the anesthesia was too deep, no one was assigned to monitor the dog’s every breath, the heartbeat was not being monitored or blood pressures were not being assessed. There are times during a procedure when a dog will stop breathing and immediate action can be taken so that breathing will return and the procedure can continue. If the dog stops breathing for a considerable period of time because no one is watching, insufficient oxygen is delivered and irreversible changes occur inside the animal’s body possibly resulting in death. We take anesthesia very seriously. There is hardly a day that goes by where we do not have a greyhound on the operating table for one procedure or another. If the dog has no pre-existing health issues and the veterinarian and the staff are doing their job properly, everything should go well. That being said, not everything is under the control of medical staff and things can happen. To minimize the unfortunate from happening, we take precautions and are very proactive about making sure anesthesia goes smoothly. Pre-operatively, we will perform a physical examination including listening to the heart and lungs, and making sure color is nice, and the mouth is pink insude. We will always suggest pre-anesthetic bloodwork, which can dictate which anesthesia we use. Bloodwork can also assure us there will be no bleeding issues and that the animal appears healthy. While it is no guarantee for a positive outcome for anesthesia, bloodwork is something we will always offer. If we hear a heart murmur, we may suggest chest radiographs or consultation with a cardiologist. However, greyhounds often have heart murmurs and advanced testing often yields normal heart function suggesting no risk for anesthesia. 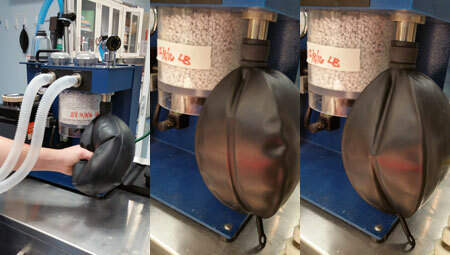 Ultimately, it is up to the client's decision for advanced testing. If cleared for surgery, we use a standard anesthesia drug protocol for most healthy greyhounds and they respond beautifully. Most importantly, we have a technician monitoring the animal continuously. 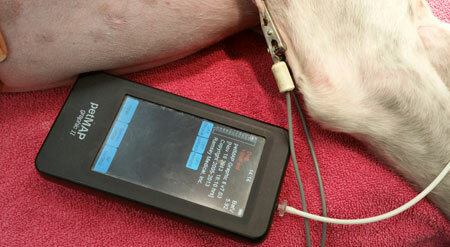 Our anesthesia monitoring sheet requires documentation every five minutes of how the animal is doing under anesthesia. Vital signs being monitored include: heart rate, breathing rate, carbon dioxide levels, temperatures, blood pressures and oxygenation. If any of these signs change, efforts are made promptly to correct the problem. 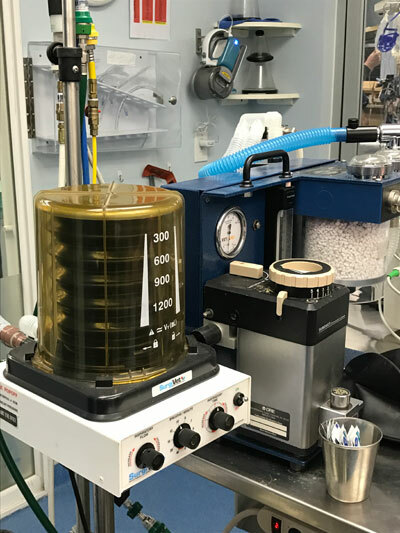 Sometimes we have to help the dog breathe by squeezing a bag attached to the anesthesia machine which expands their lungs, sometimes we have to lower the anesthesia, sometimes we need to increase their intravenous fluid therapy, or sometimes we need to add heat or cool them off with temperature modifying devices. The point is, an animal under anesthesia is in constant flux. If careful, diligent, and responsive monitoring does not take place, the animal could die. The aforementioned greyhound that died was simply not monitored. How do we know that? Because we received a copy of their records from the procedure and the anesthesia monitoring sheet was blank! The clinic that performed the dental is considered top of the line. 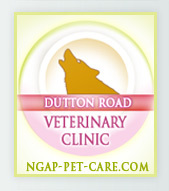 They are AAHA accredited which requires a rigorous amount of work and effort to be considered a top veterinary hospital. They were voted one of the top hospitals in their state one year, and overall did an excellent work-up pre-anesthetically with bloodwork and even a cardiologist. The dog was under anesthesia for over three hours and did fine until she didn’t. Most animals do fine and that is why so many are put under for spays and neuters and other procedures and wake up alive! But consider these animals lucky. If an animal is not monitored and they stop breathing or their heartrate drops or increases, or their blood pressure falls, immediate action needs to be taken. This dog had a necropsy which was completely normal; there was nothing obvious that caused this death. However, we suspect hypoxia, or lack of oxygenation. With lack of oxygen comes cell death and animals unfortunately die. 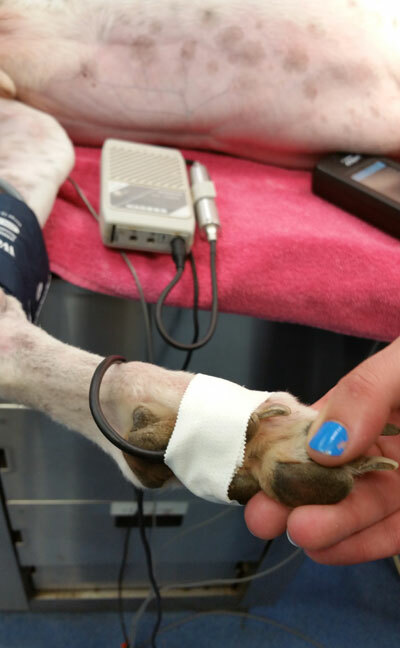 In general, greyhounds are quite hardy under anesthesia. With safe anesthesia and dosages, the greyhound goes under anesthesia smoothly and their wake-up and recovery is typically stress-free. However, our success is not due to luck or chance. We have a person monitoring anesthesia and documenting all of the vitals on every patient. If one of our technicians is cleaning the teeth for a dental, another technician is watching the patient to keep him or her alive. Here is a list of monitoring tools we are equipped with here at Dutton Road Veterinary Clinic and what we use for almost all of our procedures. In addition, we use our eyes to make sure they are breathing adequately. Blood Pressure Monitor–indicates if there is adequate blood flow to the extremities. 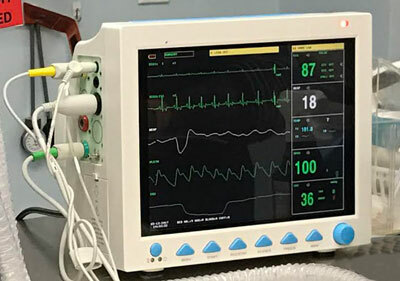 Doppler–allows an additional option for measuring blood pressure and provides another source for hearing the heart (used for longer procedures). While having this equipment is advantageous, it is useless if it is not used. Our technicians watch the patient first, constantly assessing their depth of anesthesia. They then document every five minutes how the patient’s vitals look using the above tools. If the machines suggest any of the values are abnormal, an alarm sounds and action is taken. Below lists normal parameters for dogs. In summary, it is critical to talk with your veterinarian about your concerns and to make sure they are practicing the best possible medicine. Don’t assume anything. Ask detailed questions about everything. If you have any concerns, please call us or consult our website for any questions about our anesthetic protocol. But again, it is not just the protocol, it is how well the patients are being monitored.It is never fun to write stories like this, but it is important for people to be aware of potential risks. 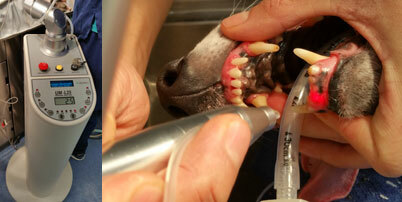 Greyhounds, and other dogs, and cats should not die when they get dentals.